We decided we wanted to have a few days relaxing on the coast of Ecuador. We checked out of the Alston Hotel in Quito on Tuesday 2nd November at 9pm. The bus station was just a 5 minute walk from our hotel, so we were able to just walk there. We had read about many buses that go to Manta from Quito and the best reviews were for Panamericana buses, so we decided to go with them. The 9 hour bus journey from Quito to Manta cost us $10 each. The bus was extremely comfortable with reclining seats. They also play a movie on the bus, which is in Spanish and they give you a drink along the way. We were a little nervous about the bus journey, as we had read so many nightmare situations, where people had their bags stolen. We just made sure we were extra careful, keeping valuables in our money belt and keeping our back packs on our knee. The big bags go under the bus and you are given a tag too show that’s your bag. Luckily we had no problems what so ever, and we arrived the next morning with all our possessions! The bus drops you off at the Panamericana bus office in Manta, which is just a 5 minute walk from the coast. We hadn’t booked a hotel, so we had to go looking for a hotel. This wasn’t such a wise idea, after spending a whole night on a bus and not getting much sleep. We finally found a really nice hotel, that was above our budget, but we decided to take it for the night, as we were so tired. The hotel was called Los Almendros Hotel and Spa. The room was $70 a night for a double room. This was way above what we wanted to pay, but the room was extremley nice, so I guess we just couldn’t resist! As soon as we got into the hotel we crashed. It was so nice to be in a comfy bed again. We slept for about 5 hours. Once we woke up we decided to take a walk along the coast. The beach was just 5 minutes walk from our hotel. There are lot’s of restaurants and shops along the sea front. We took a short walk, but didn’t go too far as we were still feeling fairly tired. Our first impressions of the coastal area at Manta, were just ok. There is quite a lot of rubbish around and the sand was no where near as nice as some of the sands we’ve seen on this trip! However it was nice to be away from the hustle and bustle of Quito. We stayed in Manta until Sunday 7th November. We spent our few days there just relaxing by the beach. We moved to another hotel called the Albatross Hotel on 5th November for 2 nights. This hotel was just $40 a night and had a swimming pool. I’d definitely recommend this hotel. The staff were extremely friendly and the rooms were basic but very nice and clean. Also we were just 5-10 minutes walk from the beach and it was great having a swimming pool in the hotel. 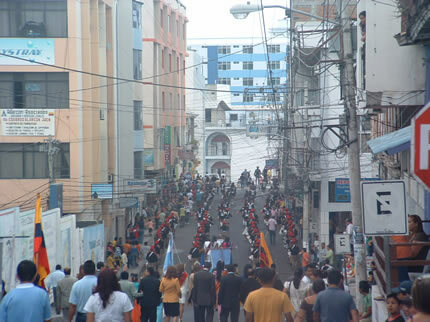 We also watched a parade in Manta one day. I’m not sure exactly what it was in aid of, but it seemed to be a parade for different regions in the area. They had a beauty queen for each area, leading the parade. 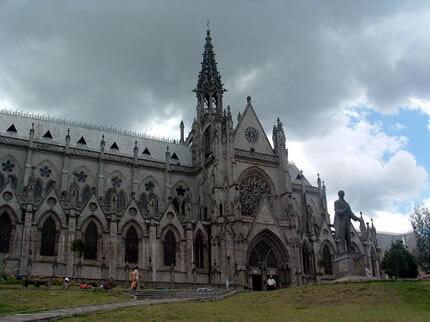 We got a bus back from Manta to Quito on Sunday 7th November. We then got a flight on Tuesday 9th November from Quito to Lima. When you leave Quito airport you have to pay $40 per person to leave the airport. You are not told this when booking flights, in fact the flights say ‘all taxes included’. We flew with LAN airlines to Lima. The flight was 2 hours long, leaving at 9.15am. 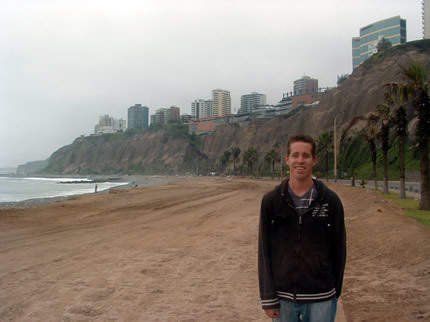 When we arrived in Lima we got a pre-paid taxi from the airport to our hotel in Miraflores. We were checked into the Kusillus Hostal, 30 minutes drive from the airport. 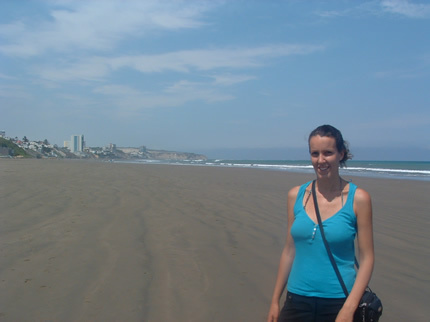 This area is very built up and is the main tourist area of Lima. It is in a great location, right by the coast. We will write more about our time in Lima very soon. We are currently in Cusco, Peru. Friday 29th October we got a bus from Quito North Bus station to Otavalo. We got a yellow metro from ‘Ave America’ to the transfer station and then we took a blue bus labelled ‘Ofeila’ to the North Bus station. It cost us 25 cent each to get to the North Bus station. As soon as we got off the bus at the North Bus Station we could hear people shouting ‘Otavalo’ Otavalo’ Otavalo’. So it was pretty straight forward finding the right ticket booth. We purchased our ticket to Otavalo which cost us $2 each for the 2 hour journey. All the buses are labelled on the front with their destination, so it is pretty straight forward. There are no specific bus times for the journey from Quito to Otavalo, they simply wait for the buses to fill up and then leave. Friday is a busy day so the bus filled up staright away. You are given a seat number on your ticket, but just as a warning they double book their seats at times, and some people end up standing up. Luckily no one was in our seat! The buses were very nice and comfortable. They have reclinable seats and there was even a tv on the bus. They played a film, however it was in Spanish. We set off to Otavalo at about 3pm. When the bus left the bus station it then stops along the way to pick up more locals. A few people were even standing up for the whole journey. Also every time the bus stopped at traffic lights people would get on to sell things like, water, sweets, dvds (fake) and other food items. Sometimes there were about 5 different people walking up the isles selling. It can become quite hectic. We got to Otavalo bus station at about 5pm. We decided to take a taxi to our hotel. We were staying in the Hostal Chasqui, which is just 10 minutes walk from the centre of Otavalo, and the markets. The hotel cost us $20 for the night. The hotel was really nice and the owners were extremely helpful. As soon as we were settled in the lady who worked there showed us where the markets were on the map and also informed us of other things to do in and around Otavalo. 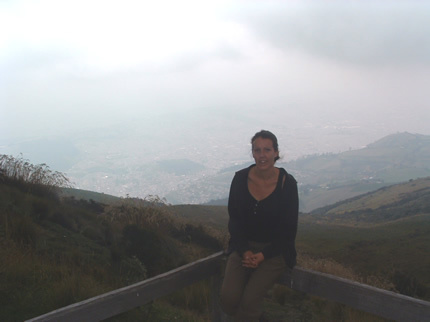 She was originally from Scotland, but moved to Otavalo 3 years ago and now lives there permanently. Otavalo is a largely indigenous town in the Imbabura Province of Ecuador.Has 30,965 inhabitants. The town, which is in a valley, is surrounded by the peaks of Imbabura 4,630m, Cotacachi 4,995m, and Mojanda volcanoes. The indigenous Otavaleños are famous for weaving textiles, usually made of wool (that is sometimes as black as a raven), which are sold at the famous Saturday market. 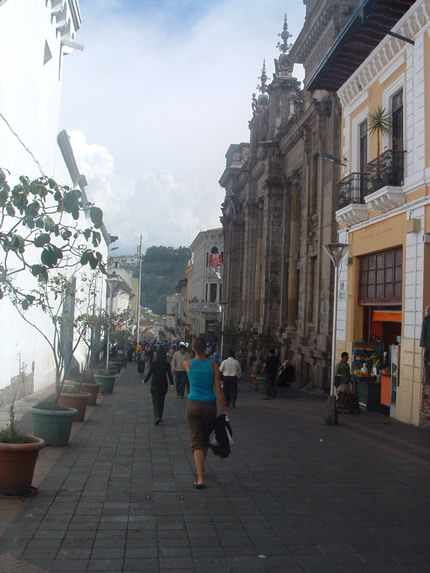 We took a walk around the centre of Otavalo. The town is really beautiful, surrounded by mountains and volcanoes. Tourism is becoming more and more popular here, because of the famous markets that they hold. So Saturday morning we woke at about 6am to go to the animal market that is held every Saturday from 7am to 10am in Otavalo. It is found near the Panamerican highway. Locals come to sell their sheep, cows, goats, pigs, guinea pigs, chickens, hens ect. 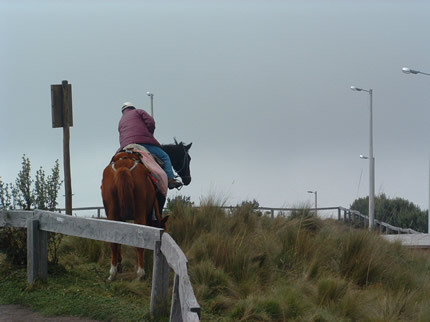 It is held in a big field near the town of Otavalo. Once we got closer to the location of the market, we were able to use our ears to direct us! We found a near by bank that we sat on. We were able to see all the action up here and not have to be amongst the craziness. We had never seen anything like this before. So much was going on that we were constantly turning our heads to try and catch everything. By 7am the field was full of sellers with their animals and locals walking around the view the animals and decide which they would buy. People were also arriving all the time with new animals either in a truck or simply walking them with a string tied around them. We noticed one man who bought a pig and then sold it on to someone else, he must of been good at haggling. At times the pigs would break out into a fight and some of the pigs broke free from their owners and they had to run after them. We got a short video of this. Notice the woman at the back slapping the pig, this made me laugh! We couldn’t seem to pull ourselves away from the animal market, it was just so fascinating, but we wanted to check out the other main market also. We decided to take a quick walk amongst the animal market before heading off. This was crazy and after just 5 minutes I wanted to get out. There were animals running all over and so many people trying to push by to buy an animal. We noticed people were calling over taxi’s to put their animals into the boot! We were trying to find out how much the locals were paying for these animals. 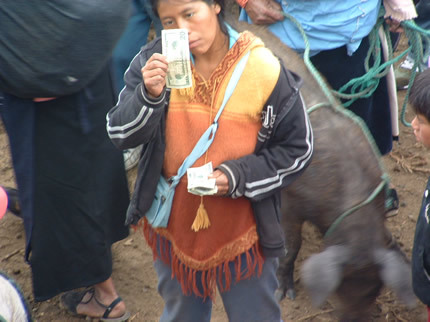 We managed to catch one woman selling a pig and she got $100 for it. 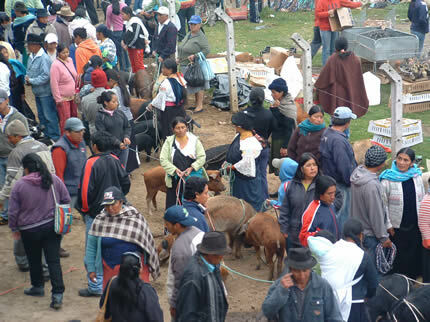 If you are in Otavalo make sure you check out the animal market on a Saturday morning from 7am to 10am. Most of the selling is complete by 8am so get their as early as possible. 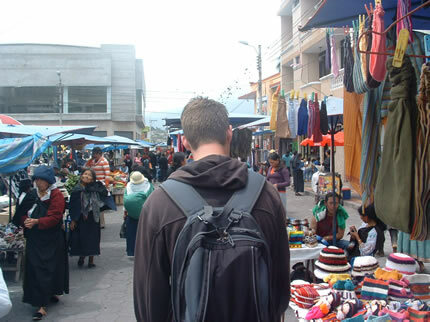 Next we went on to check out Otavalos main market which you will find on all the streets of Otavalo centre. It just keeps going on and on! We haven’t really bought much on our travels, as we didn’t want to be carrying it around with us, plus it gets costly. However we decided we would buy a few things as we only have 1 month left before we head home. The markets have so many things to choose from, most of which is hand made by the locals. You can get some really good deals, but you have to be prepared to haggle as they will start the prices really high. Also if you arrive in the mid afternoon when all the other tourists are around, they will be less prepared to put the prices down as other tourists will pay more! 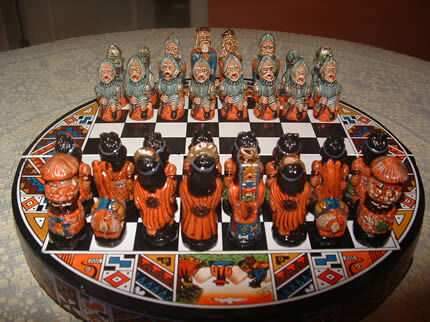 Paul had seen some nice chess sets in Quito, so decided he would look out for one on the markets. He finally found one he wanted. The lady wanted $15 for it but we managed to get it for $10. I also wanted to buy a musical instrument. I went to one stall where a local man was showing me how to play the different instruemnts. He had different varieties of pan pipes, and many other flute type instruments. After spending about 20 minutes playing the different intruments I settled on the Rondador which is a set of chorded bamboo pipes. 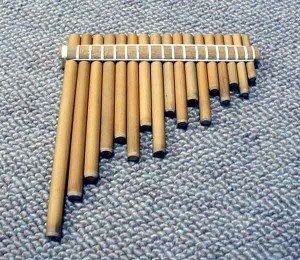 The rondador is a set of chorded bamboo panpipes that produces two tones simultaneously. It consists of pieces of cane, placed side by side in order by size and closed at one end, and is played by blowing across the top of the instrument. The rondador is considered the national instrument of Ecuador. He had all different varieties of sizes and keys of all the instruments. He was able to play them all extremely well. It will take me a lot of practice! He wanted $15 for it, but I managed to get it down to $10. We bought a few other small gifts for people. I could of kept buying, but I had to stop myself. We always went lower with the first price they said, and funnily enough they never hesitated, which tells me we could of gone lower! We really enjoyed looking around the markets and wished that we’d planned to spend another day in Otavalo, but we had left our main bags in our hotel in Quito, so needed to head back. Otavalo is a great place to meet the indigenous people of South America. You will notice that the locals here wear the traditional clothes. Otavaleña women traditionally wear distinctive white embroidered blouses, with flared lace sleeves, and black or dark over skirts, with cream or white under skirts. Long hair is tied back with a 3cm band of woven multi coloured material, often matching the band which is wound several times round their waists. They usually have many strings of gold beads around their necks, and matching tightly wound long strings of coral beads around each wrist. Men wear white trousers, and dark blue ponchos. We took a bus back to Quito at about 3pm. We just went to the Otavalo bus station and as soon as we got there the bus to Quito was ready to leave, which was lucky for us! Today we are heading to Manta, along the west coast of Quito. We are looking forward to a few days of relaxation at some of the beaches along the west coast. 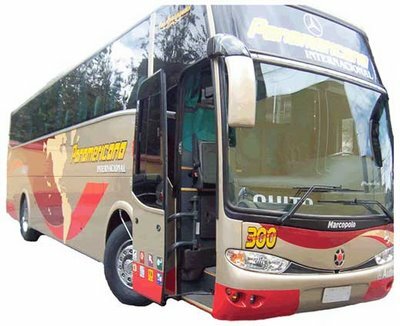 We will be taking a 9 hour bus journey from Quito to Manta, with a bus company called Panamericana Internacional. The bus leaves at 10.30 pm and gets us to Manta at about 7am. We will keep you up to dated about our arrival in Manta as soon as possible. Tuesday 26th October we decided to climb up the hill in the Old Town to see the statue of the Virgin of Quito, which is located on top of El Panecillo hill. 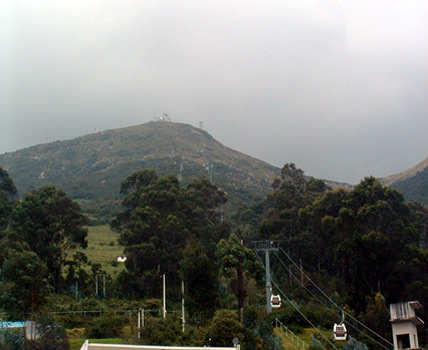 El Panecillo is a hill located in the middle west of the city at an altitude of about 3,016 metres (9,895 ft) above sea level. 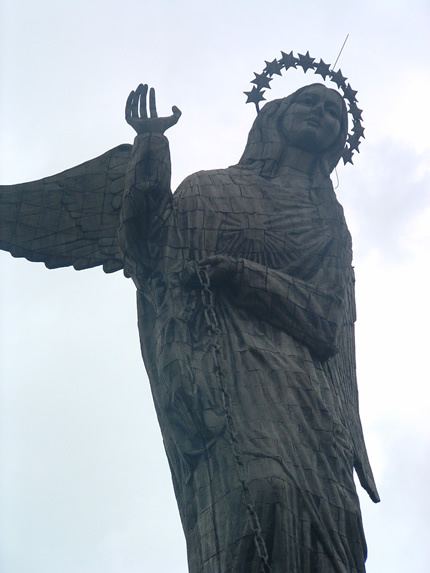 A monument to the Virgin Mary is located on top of El Panecillo and is visible from most of the city of Quito. In 1976, the Spanish artist Agustín de la Herrán Matorras was commissioned by the religious order of the Oblates to build a 41 metres (135 ft)–tall aluminum monument of a madonna, which was assembled on a high pedestal on the top of Panecillo. Made of approximately 7,000 pieces of aluminum, the monument was inaugurated on 28 March 1976, by the 11th archbishop of Quito, Cardinal Pablo Muñoz Vega. We decided to walk up to the statue instead of taking a taxi. The walk up to the statue was the most interesting part. When walking up to the monument, we passed by locals houses and small shops. We saw lot’s of homes on the hills that were like shanty homes. The more we walked up the hill, the more people stopped and starred, I guess they mustn’t get many tourists passing by. We passed by this girl who was about 2 years old. She was sat on her Mum’s and Dad’s knee, with a news paper in front of her. They were using the paper to teach her to read, I thought this was very cute. The higher we went up the more we able to see over the city. The buildings over the city are all different colours, red, yellow, pink, orange. We could also see may cathedrals around the city. The one thing I didn’t like about the walk up to the statue was the amount of dogs that come over barking at you. I don’t know who owned the dogs, they just seemed to be roaming free. After about 30 minutes of up hill walking, we finally got to the Virgin of Quito Statue. After about 5 minutes of being at the statue a thunder storm started. This was a great place to view it. We saw some amazing strikes of lightning right across the city and also close by to many in coming aeroplanes. This was more amazing than the statue that we had come to see. Wednesday 27th October we went to visit ‘Mitad Del Mundo’, translated as ‘Middle of the World’. This is where the line of the equator is and also a monument that was built to mark the equator. The Mitad del Mundo is located in the San Antonio parish of the canton of Quito, north of the center of Quito. The 30-meter-tall monument, built between 1979 and 1982, was constructed to mark the point where the equator passes through the country in the geodetic datum in use in Ecuador at that time. A line down the center of the east-facing staircase, and across the plaza, was meant to mark the equator, and countless tourists over the years have had their pictures taken straddling this line. In the modern datum of the World Geodetic System, which is used in GPS systems and computer mapping products like Google Earth, the equator is placed about 240 meters north of the marked line. This discrepancy is partially due to increased accuracy but primarily due to a different choice of mapping datum. Similarly, the line marking the Prime Meridian at the Royal Observatory, Greenwich in England is roughly 100 meters from the exact zero of longitude as indicated by GPS receivers. So even though this is where everyone goes to see the equator and get their pictures taken ect, it is actually 240 meters off the mark. We got to Mitad Del Mundo by bus from the city. 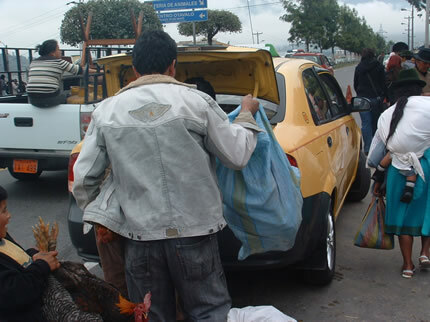 First we took the yellow metro bus from ‘Ave America’ to Ofelia transfer station. Then we got a blue bus marked ‘Mitad Del Mundo’ on the front to the equator. This took about 1 1/2 hours in total and cost us 55 cent each. Mitad Del Mundo is completely built up around tourism. As soon as we got off the bus we were bombarded by tour guides, asking us did we want a tour. The answer was of course no. So we set off and did what every other tourist does and got our picture standing on the line of the equator. It was pretty cool to be standing on the line of the equator, one foot on the southern hemisphere and the other on the northern hemisphere, but other than that there really isn’t much else to see. There are tourists shops and a few restaurants at the site, but of course the prices are high compared to anywhere else. 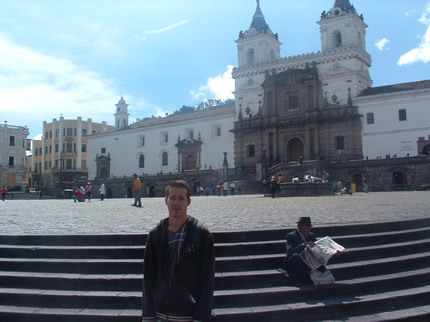 Thursday 28th October we took a look around the old town of Quito. This is where you will find the narrow, colonial streets. The old town is by far the nicest part of Quito. We visited many cathedrals and old buildings. This is just a quick over view of our first few days in Quito. We will write about our time in Otavalo very soon. 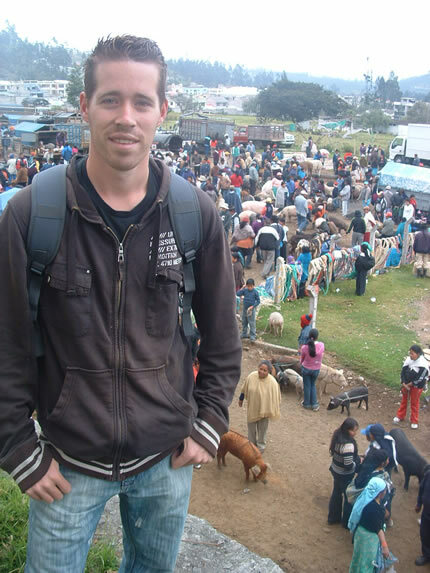 We have just got back to Quito from Otavalo today, after spending Friday night there and going to a massive market, which is held there every Saturday. We are starting to get used to the Altitude and seem to be getting less headaches. For the first 3 days we had banging headaches and we were finding it hard to breathe. The body can cope with up to 8,000 ft, but we are over 9,000 ft. Since having 1 of our camera’s stolen, on a local bus on our first day, we have decided to take even more precaution. I am no longer wearing my wedding rings (Paul lost his anyway), I only take out a small amount of money and we only take the camera out if needed. It feels so good going out with no valuables, you feel a lot more free and it is easier to enjoy the day. One suggestion was given to us to buy disposable cameras when in busy areas, I know they are not as good, but its better than having our other camera stolen. We moved to a new hotel on Sunday, as it is half the price. We are now staying in the Alston Hotel, in between the old and new town. The hotel is more basic than our last hotel, but it is only $29 (£18) a night and it has everything we need. Monday 25th we decided to check out the Teleférico. This is a cable car ride that takes you up the edge of Pichincha Volcano, which is an active Volcano.The highest peak is 15,696 ft. The cable car ride takes you to the Cruz Loma lookout which is at 13,400 ft.
We decided to walk to the foothill of the Volcano, where you get the Cable Car. On google earth this walk only looked about 20 minutes from our hotel, but when you get closer it’s all up hill to the cable car, so in reality it took us more like 1 hour. It was a good work out, that’s for sure. No one else seemed to be walking it apart from us, and all the taxi’s were beeping us to see if we wanted a ride, maybe that would of been the easier option! The entrance ticket for the return on the cable car cost $8.50 for foreigners and $3 for locals. We were in a cable car with a mother and daughter from New York. Our ears were popping on the way up. The journey up takes about 20 minutes. By the time we got to the top we had gone from 8,850 ft to 13,400 ft. I was trying to grasp how high up we were. Well the empire state building is 1,250 ft, so we were the height of nearly 11 empire state buildings. This really is the best place to view the city as a whole, on a clear day you’d be able to see for miles in every direction. It was cloudy when we first got to the top but it started to clear up. At the top there is a small cafe and a shop but apart from that it’s just you, the other tourists and the scenery that goes on for miles. It is quite impressive looking out from such a height. You can climb a further 2,000 ft to the peaks of the volcano, but our ears weren’t up for it. How did this horse get up this high? We had a cable car all to ourself on the way back down. It was definatley worth waiting till a week day to go, because at the weekends they are meant to get really busy. There were only about 10 other people at the top, which was great. There are taxis always waiting around at the foothill and also a bus that costs $1 each, so you don’t need to worry about arranging transport. We decided to walk back anyway, as at least it was down hill this time! We got a flight from Auckland to Quito on Thursday 21st October. We left Auckland at 5pm (NZ Local time) and we arrived in Quito at 9pm on October 21st. We had a stop over in Santiago (Chile) and we also touched down in Guayaquil (Ecuador). We were so tired when we arrived in Quito as we’d been travelling for a total of 22 hours. It was so confusing arriving in Quito just 4 hours later than when we left Auckland, because of the time difference. Our flight into Chile was beautiful, taking us over the Andes. We wished that we had booked a few nights in Santiago now, but we didn’t think about it at the time. We were a little bit nervous about arriving in Ecuador as we’d been back in the Western world for 4 months (Australia and New Zealand). We loved our time in Asia and we were sad when it came to leave. At first we found it strange being in Australia as we were no longer being starred at and things were ‘normal’ again. I guess we missed the unfamiliarity of Asia. However after a few days went by, you start to slip back and relax. It was nice having 4 months where we could just enjoy every place we went to and most of the time, feel fairly safe. We decided to do a lot of research about South America, just so we could be prepared for things that may happen when we are there. So we both felt pretty prepared for the situations that we could be in. 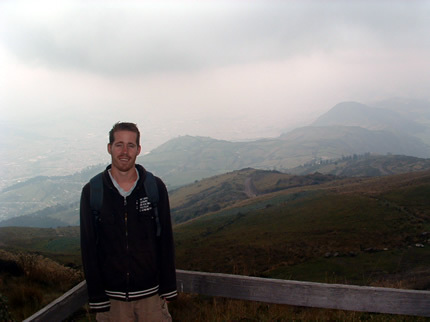 Arriving in Quito was actually quite a breeze. We got off the plane and went through passport control with no problem. You get a 90 visa on arrival (free of charge) if you are from the UK and Ireland and several other places…check projectvisa.com for more information. You are given a stamp on arrival with the date marked in your passport. We had a hotel booked, as we knew we were arriving late, so we got a pre-paid taxi to our hotel. There is a cash machine just outside of the airport and the taxi booth is just on the inside, as you come out of baggage claim. The local currency is the US dollar. You pay for the taxi at the booth and then they show you to your taxi. We had read a few scams that go on with taxi’s. One is that they tell you that the taxi is broken down and ask if you will help get out and push it-then they drive off with your bags in the taxi! Well lucky for us we arrived at the hotel fine. 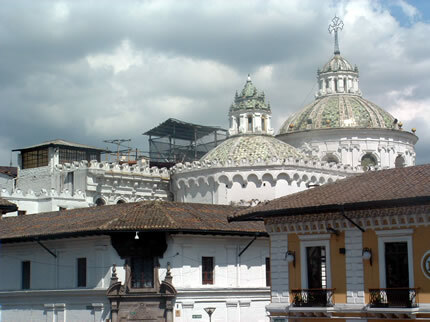 We are staying in the old town of Quito in a hotel called ‘Hotel Real Audiencia’. We are just staying here for a couple of nights as it’s a little expensive for what we can get here, but we wanted the first 2 nights to be comfortable. Our hotel is in a really nice location, with mountains around us and we are right near the square of the old town. We were both extremely tired when we got in so we got to sleep straight away. We woke up this morning at about 7.30am with banging headaches, we were unsure about weather it was just because we were tired, but then we remembered that Quito is actually over 9,000 ft above sea level. It says in a lot of the books we’ve read that you can suffer from Altitude sickness. We have both felt light headed all day, but I’m sure we’ll adjust soon. We’ve been drinking lot’s of water. It just feels like we are out of breath all the time. We decided to take an adventure out into the city today, but first we made sure we were all secure. Making sure we only had necessary things on us and that everything else was locked away. So we put our passports and money in the safe and all we took out with us was a little bit of cash (in my bra) and my small camera-which I tied around my waist. So we both felt pretty secure. First of all we went out to look around the old part of Quito. We loved all the narrow little streets, with brightly coloured buildings. I love all the sounds that you hear when you go to a new place. We could hear people shouting from stalls, cars beeping, trams with music playing from them, people selling fruit and veg. I’d forgotten how it felt to be starred at. We got used to it in Asia and didn’t mind in the end, but I guess even 6 months in Asia wasn’t enough to get me used to that feeling. As soon as we came out of our hotel it was like we were in the spot light. I thought maybe I could blend in after 8 months of tanning, but no!! haha. We stand out so much. I try not to take the map out so much, just so we can at least blend in a little. 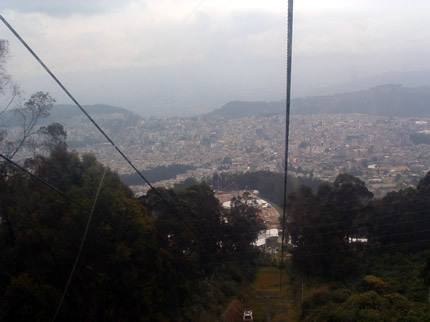 In the afternoon we got a trole (tram) from the old town to the new city of Quito. The trole just costs 25 cent per person, no matter where you are going in the city. The new city is where all the shopping centres are and high rise buildings (and Mc Donalds says Paul). We took a look around the shopping centres there and went to a couple of the markets to look at food prices. That is definitely a positive thins about Ecuador, the price of food is cheap again. You can get a meal for just £1-2 and a bottle of water is just 10-20 cent. We took the trole back to the old town. It was packed, we were literally like sardines in a can. I hate the feeling of being trapped in, and that’s exactly how it felt. We had 7 stops to go and it was getting more and more packed. I was holding onto my camera as that was the only valuable thing anyone could get from us. Paul felt a woman put her hand in his pocket, but luckily he had nothing in there. I was making sure I was holding the case of my camera as we were getting so close to people. We just had 1 more stop to go and I couldn’t wait to get off. I looked down at the case of my camera was open and the camera had gone!! I was so angry because I’d had my hand on it for the whole time. I couldn’t believe how still someone had managed to get into the case and get the camera without me noticing. I guess they are experts! I tried looking around to see if I noticed it on anyone, but of course they had probably got off by now! In the end I’m just annoyed at myself, I guess I need to be even more careful! Luckily it only had a few photos on from today and we still have our better camera. I just don’t know how to succesfuly take the camera out without getting stolen and we want to take photos, so it’s a difficult one. Paul is in the process of trying to come up with a solution. He managed to lock the camera up so well that we couldn’t even get it out to take photos, haha. If you have any suggestions please let is know. So overall it’s a pretty good start to our time in South America! Let’s hope tomorrow is better!